Where has the AMC work gone? Hope everything is going well out in appraisal land! I know for me my AMC work has steadily declined over the past few months. 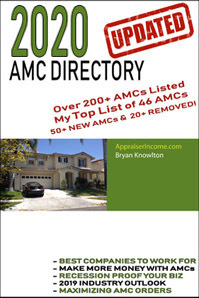 Since work has been so great and plentiful over the past couple years I rarely found the time to update my profiles on numerous AMC websites so when a few of my top vendors started hiring in house appraisers, my AMC volume went from 40 requests a week down to about 10. Now I am lucky if I can accept 2 orders a week from the AMCs. Luckily I have a fair amount of non-lender work due to some recent advertising campaigns, but I still count on a fair amount of AMC work to make ends meet. What are other appraisers seeing out there with AMC work? How many orders do you do a week now compared to 3 months ago? I would really appreciate your feedback, please leave a comment below. BTW – I have started updating all my profiles with the other 250 AMCs I have registered with in the past. I will keep everyone that posts a comment below updated on how that goes. Honest appraisers could have profited greatly by becoming dishonest appraisers who would be given the lucrative assignments by fraudulent lenders’ controlling officers and their agents. Instead, honest appraisers suffered serious losses of income because they refused to succumb to the extortion efforts of the fraudulent lenders and their agents. A national survey of appraisers in early 2004 found that 75 percent of them reported that they were the subject of attempted coercion designed to inflate the appraisal during the past 12 months. A follow-up study in 2007 found that percentage rose to 90 percent and that 67 percent of appraisers reported losing a client and 45 percent did not get paid their fee because they refused to inflate the appraisal during the past 12 months. Many honest appraisers were driven out of the profession by the blacklists the fraudulent lenders’ controlling officers and their loan brokers used to deny business to honest appraisers. …continue reading the rest of this post: Why Are Appraisers Furious at Fraud by Their Peers While Corporate Lawyers Are Complacent? US Appraisal Group – about to go bankrupt? Dianna Stieri the prior owner of US Appraisal Group sets the record straight. After posting that a possible bankruptcy was looming for US Appraisal Group, I received calls from the prior owner and their Legal team in regards to my post. Dianna has advised that there is pending litigation in regards to the information that has been sent out. She also stated that Appraisers have been contacted due to a billing dispute between a couple clients with US Appraisal Group and that appraisers were being requested to negotiate instant payment or set up a payment plan to receive payment. She also stated most appraisers were owed between $250 – $400 each and that the total amount owed was not in the millions. (I didn’t ask a specific $). At this time the company has been acquired by another AMC and all inquiries are being forwarded to their accounting department. Having problems getting paid by LCAM or Lenders Choice Appraisal Management? 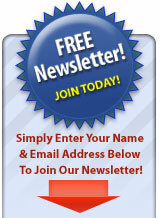 Anyone having problems getting paid by LCAM or Lenders Choice Appraisal Management? We have been notified with payment problems on open appraisals from LCAM/Lenders Choice Appraisal Management. Before it becomes a big problem and appraisers are stiffed with millions in unpaid invoices, we thought we would reach out to other appraisers first and finally follow up with the AMC in question. 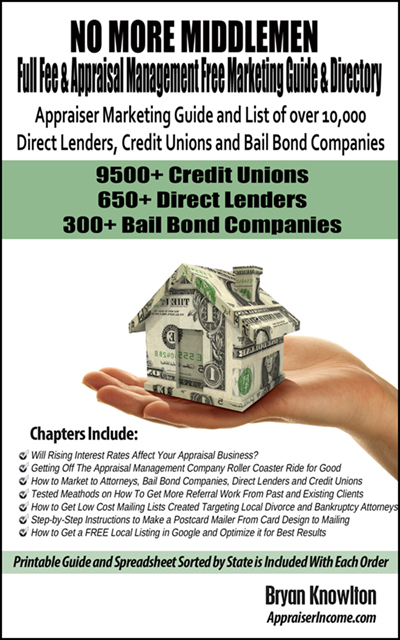 Take the time today to order my New Book & Directory – No More Middlemen – Full Fee & Appraisal Managment Free : 2013 Appraiser Marketing Guide and List of 3400+ Direct Lenders, Credit Unions and Bail Bond Companies and finally get off the crappy appraisal management company roller coaster ride for good! Of course, all you’re reading is stories about the 12.2% year-over-year price surge that’s started the buzz about the next housing bubble. And it’s true too, housing prices have gone up. Financial manipulation and corporate propaganda DO work, even in an no-growth, high unemployment economy where half the college graduates under 30 are shackled to loans they’ll never repay, where one-in-six people scrape by on food stamps, and where “four out of 5 U.S. adults struggle with joblessness, near-poverty or reliance on welfare for at least parts of their lives.” (AP News) Hurrah, for the American Dream! Hurrah, for propaganda!